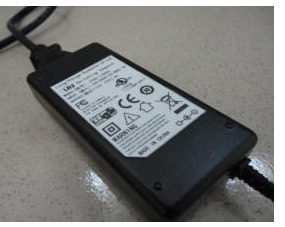 LRS standard power supplies - check them out. LRS power supplies (PSU) are unique to Long Range Systems UK. If you need a power supply please call to confirm exactly which unit you need. Our newest power supply is a 'switched mode' type of power supply that has the advantage of being high power but also a smaller footprint than many power supplies. The image above is of our regular power supply that is used for nearly all of our equipment EXCEPT for our coaster pager system which uses this power supply. Power supplies are extremely important and ours are custom made to our exact needs so simply buying a replacement on line is not an option because we use non standard voltages. Our power supplies are all CE approved and RoHS compliant guaranteed. All of our power supplies carry a three year warranty against manufacturers defects. Ensure you only use our genuine power supply with our label so that you get the benefit of warranty on your system. Failure to do so will render your equipment warranty null and void. Clearly the correct power supply is critical in the successful operation of your paging system to work correctly and to ensure that equipment remains completely safe. We always supply the correctly marked power supplies to specific systems. Our Power supplies meet all current regulations including CE, RoHS and other required specifications for the UK and Europe.